With its incredible harbour and green spaces, Sydney is considered one of the most beautiful and liveable cities in the world. The Sydney city and surrounds is made of up of a range of diverse 'villages' with their own unique identity and character and we encourage you to explore as much as you can. The city offers a range of accommodation options to suit your lifestyle and budget. Many of our students start off in student accommodation or homestay when they first arrive, before moving into rented share accommodation with friends. Most students live within thirty minutes of the Sydney Campus by public transport, which is located right in the heart of the CBD, directly opposite Hyde Park. Making it easy for you to access wherever you decide to make your home. While we don't manage accommodation, we have some great contacts to help you find the perfect place to stay while studying with us. Below are some of our recommendations. Our homestay accommodation is organised through Auzzie Families. They offer a unique personalised accommodation service for students and visitors of all ages, and give you the opportunity to experience living with an Australian family (Homestay). From your arrival to your departure you will receive ongoing support. A link between you and your accommodation provider, ensuring that both are happy. Host families are hand picked with care and are welcoming, clean, friendly, easy going and helpful. The opportunity to experience the 'real' Australia – have fun learning the idiom and humour of the language and discover a forthright, gentle and fun-loving people. A range of services to suit your needs including group bookings. An extensive database of families waiting to welcome you into their homes. You can choose between single or shared room (if booking with a friend or family), with or without meals on the weekend, even executive style homestay or granny flats. Pricing differs according to homestay type. A weekly rental rate ranges from A$205 for a twin share no meals option, to $440 per week for executive homestay. Placement and administration fees apply. Purpose built for students, Iglu Student Accommodation offers the supportive benefits of student accommodation along with the flexibility of an off-campus lifestyle. Choose a 4, 5 or 6 bedroom share apartment, with your own secure bedroom and ensuite or twin-share bathroom, if you want to live with friends or make some new ones. If you would prefer your own space, a studio apartment with private en-suite bathroom is the perfect option. You can choose between two locations – Iglu Central and Iglu Chatswood. Both are located within easy reach of major universities and colleges, public transport, shopping, eating, fitness and entertainment facilities. 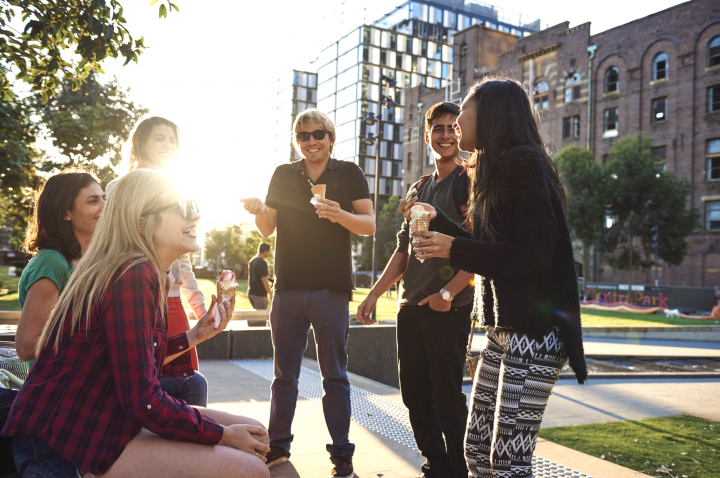 Iglu Central is set amongst Sydney's vibrant Broadway area with everything you need on the doorstep and only a short bus or train ride to our campus. Chatswood is a vibrant, bustling suburb on Sydney's north shore, and is less than 15 minutes from the La Trobe University Sydney Campus via train. Pricing differs according to room type and location. A weekly rental rate ranges from around A$346 to $496 per week (Chatswood), A$408 to $530 per week (Central) and includes all utilities and a base internet package. A security deposit is required. Games areas, courtyard with BBQs, study areas and more. urbanest is student accommodation in the city, where you can enjoy a superb lifestyle with the best rooms, study areas and social spaces. Sydney Central - located in the educational and cultural hub of inner-city of Ultimo, it is only a short walk to the Broadway Shopping Centre, and near the trendy area of Glebe. Quay street - urbanest Quay Street is in the highly sought after suburb of Haymarket bordering Chinatown renowned for its bargain shopping and irresistible Asian restaurants. An ideal location for students within easy reach of Sydney universities and two blocks from Central Station. Pricing differs according to room type. A 12-month weekly rental rate ranges from around A$320 to $540 per week (includes all utilities and a base internet package). A security deposit required. UniLodge offers beautifully appointed self-contained, furnished studio apartments conveniently located close to public transport, universities, cafes and more. Choose a twin or balcony bunk, if you wan to live with a friend or make a new one. If you would prefer your own space, a studio apartment with private en-suite bathroom is the perfect option. UniLodge offers student accommodation at three different locations and each of them is unique and varies in the room types offered and pricing. UniLodge Wattle Lane, located in Ultimo, offers only studio apartments and is more suitable for mature students. UniLodge on Broadway is an excellent choice if you are a student looking for accommodation that offers convenience, safety and security. There is even a swimming pool, spa and gymnasium in the building for students to use. Pricing differs according to room type and location. A weekly rental rate ranges from around A$385 to $610 per week and includes all utilities & a base internet package. A security deposit is required. There are a lot of different room options available, depending on location and your budget – twin share, standard/deluxe studio apartments, loft apartments, apartments with or without air-conditioning, with or without balconies and so on. Check all locations to find the one that fits your lifestyle and budget best. Features and facilities depend on your location – most have BBQ areas and amazing roof tops, private study rooms, secure building access, high speed internet and more. After settling into life at university. many of our students decide to move into a private rental with their friends. Suburbs with the highest La Trobe University Sydney Campus student population include Rhodes, Burwood and Zetland but anywhere with good public transport links is ideal. It's fair to say that the laws around renting a property may be different in Sydney, in fact there are different laws in each state of Australia. Therefore, it's a good idea to familiarise yourself with your rights and responsibilities as a tenant before signing a lease.